TV Land’s original programing was founded on the tenets of the traditional sitcom, but the cable channel has found greater critical success since it completely abandoned those early principles. It’s shifted its focus to Gen-Xers, that oft-neglected demographic, with single-camera comedies that have an edge to them. Sometimes this works better than other times: The Jim Gaffigan Show, for example, is the perfect platform for its titular comedian, taking on the family sitcom and skewing it to fit his voice and stand-up persona, while still being inherently okay for the kiddies to watch. The show allows for Gaffigan’s voice to be unfiltered, a fictional take on his life without the restraints of a network sitcom. George Lopez has worked inside those restraints before, in his eponymous 2002-07 ABC sitcom. It was a broad family comedy that was unique in the ethnic makeup of its cast—which is not something to ignore, but doesn’t mean George Lopez pushed the boundaries of comedy. He’s also tried his hand at cable comedy before, although the results were similarly broad: FX’s one-season Saint George spent most of its time making sure that Lopez still seemed like a nice guy, even if it bumped up its comedic edge a little bit. At first, Lopez’s TV Land project feels entirely different from his previous shows. 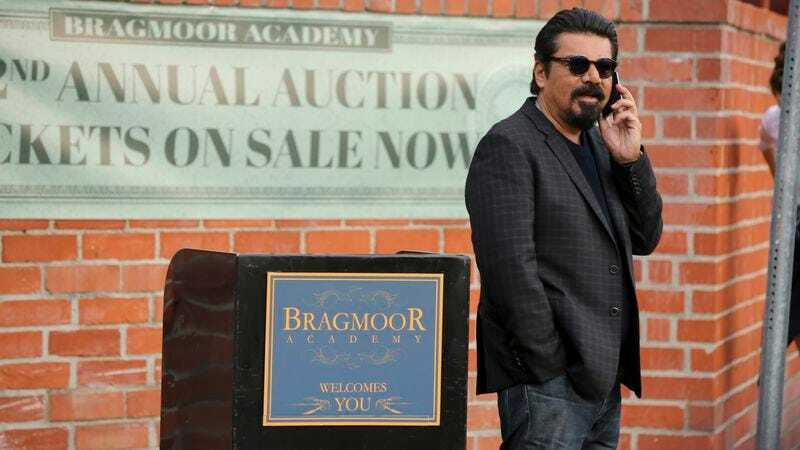 In Lopez, the star doesn’t waste a good deal of his energy straining to be the good guy, something that seemed to be a prerequisite of the less complicated George Lopez and Saint George. It’s liberating for Lopez, and in line with what TV Land has been trying to do all along: create new sitcoms that put a spin on old ones. This is Lopez in Lopez: a guy whose teenage daughter doesn’t like him, who (accidentally) mistreats a beloved former mayor of Los Angeles, and whose real-life divorce from his wife—after she gave him a kidney, no less—is brought up within the show’s first 10 minutes. Being bad is a good look for Lopez. He’s not hamming it up like he’s waiting for the studio audience to laugh. In this show, he plays down even his energetic stand-up persona for something more subdued. More importantly, he doesn’t just play his ethnicity for jokes or as a character trait—he interacts with it and talks about it. There are slapstick moments: At his daughter’s school, he chats with another Latino man he thinks is a parent of another student. Turns out, he’s the valet. When he’s leaving the school, a white parent mistakes Lopez for the valet and tries to hand him his ticket. Later in the episode, Lopez absentmindedly hands his valet ticket to someone else, who happens to be former L.A. mayor Antonio Villaraigosa. But Lopez’s discussion of cultural heritage can go deeper than that. A Vegas residency is dangled in front of the comic, although promoters are worried that his audience leans too heavily black and Latino to make it work. That’s not really something Lopez ever had to worry about on his other shows. Before, Lopez’s use of his ethnicity felt groundbreaking because he existed as a sitcom dad. Here Lopez tries to take that discussion further, looking at the class and cultural divides that he faces as a famous Latino man. But even in the first episode the cracks begin to show: The guy who toplined those other shows still has his name in the title here, and his more traditional sitcom tendencies seep through those cracks, especially in the second and third episodes. Lopez doesn’t pressure its star to be the nice guy, but as the episodes progress, he still falls into that trap of portraying the only sane man flabbergasted by the ridiculous world around him. All of Lopez’s interactions with his agent (Hayley Huntley) feel tired and worn. Lopez, a man who has made a name for himself in traditional media, now has to start acknowledging the existence of figures in new media, like the Vine star his agent wants to hook him up with. The generational divide, among other aspects of Lopez, is much less interesting than the real and important conversation Lopez sometimes engages in. It’s not to say that Lopez can’t be fun: On the broadcast networks, Black-ish and The Carmichael Show are proving that weighty topics can make for funny episodes, and Lopez occasionally does as well. There is potential for Lopez, but George has to stop relying on old tricks.